Cobb County Libraries in Trouble! I read about library closings all over the county. Since 2008, every issue of ALA’s American Libraries mentions some article about library closings…11 branches shut down in New Jersey…another 13 shut down in Nevada…etc etc etc. However, a colleague of mine who works for the Cobb County Library system recently posted on Facebook that, in order to balance the budget, Cobb County officials are going to shut down all but FOUR libraries in this very large and populous county. This really hit close to home. While I no longer am a Cobb County resident *sniff* I felt that I had to say something. The Cobb County libraries were such an integral part of my life. I spent so much time there, especially during my school years. Please reconsider your proposed closing of Cobb County libraries. Thousands of Cobb residents depend on the libraries for internet access, reference materials, and critical information. In doing so, you will be cutting off many people from this. Cobb is a huge county, and 4 libraries are not enough. Each day, Cobb County librarians and staff are harried and busy, helping people with filing tax returns, apply for jobs, assisting patrons with major purchase decisions, and pointing students in the direction of the right sources for school projects. This is a typical scenario that I have witnessed each time I was at the East Marietta Branch or Vinings Branch libraries, two of the libraries that you propose shutting down. I grew up in Cobb County my entire life, and the library was an integral part of it. As a child, I remember story-time and voraciously reading about topics of interest at the East Marietta Branch. I worked as a page at the Vinings branch during high school, and as an adult, I have utilized Cobb County libraries to do the following: register to vote, research for the purchase of a new car, teach myself programming languages, learn about traveling in a new country. You probably think that you can get “everything on the Internet” these days, but it is not free and not cheap. When you find the NY Times upping its digital subscription prices (which it already is), and you are flabbergasted you have to pay to access stuff like Consumer Reports online, you will wish you have some place to go where you didn’t have to pay so much for basic reference materials (which, by the way, are getting more expensive that even the affluent citizens of East Cobb will not be able to afford). Libraries do a lot more than store books and offer a few terminals to people who cannot afford their own PCs. They offer programs to educate and equip people to gain skills and knowledge that will enable them to become more informed citizens…to equip them to find work so that more people can pay the taxes which will then support your infrastructure. I am sure you are aware that the reason you are in the predicament that you are in is because of the lack of jobs in Georgia, which in turn reduces the amount of revenue-generating taxpayers. It amazes me that Georgia officials are often turning to education for their biggest cuts. Cobb County alone laid off hundreds of teachers last year, resulting in class sizes that are too large to provide quality education. I am really liking this Clean Home theme! Since I am too cheap to pay for CSS editing ;), this theme allows customizable colors, background AND header! And it just has a much nicer, larger, and more readable text than my previous theme. The background image used is courtesy of WebTreats. They have a great Flickr gallery of icons, Photoshop patterns, etc. In other news, and the reason for the lack of posting, is that I have secured a new professional position. I have been working in my new job a little over a month now. And, like many of us in the library field, I relocated so that I could take it. I am very thankful. Moving is very, very tough, and it was not particularly easy, but I definitely think it was worth it. And I have a great apartment in a great location :D.
The job is right in downtown Washington, DC, and I am working for a huge, international law firm with a variety of different practice groups. I do a lot of different aspects in this position, but my overarching theme is utilizing technology to assist the attorneys with their law practices and client development. I am getting some great experience and skills in this position, and I have always liked the DC area. There is a lot more variety here, and it’s a good place to start my career (FINALLY!). Although I am ashamed to admit it, one of my favorite sites is http://www.collegehumor.com. I cannot begin to tally the countless hours I have wasted on this site…watching funny videos, reading articles about Facebook fails, sexual frustration, and second adolescence. However, I am 27 years old…and now 5 years out of college! Yet why does this site seem to pinpoint and satire so accurately the intricacies and nostalgia for those of us who graduated college in 2003 – 2009? After all, for the most part, we are all pretty well out of college. One thing that baffles me is that most kids who are in college today were either not even born to remember the glory of growing up with just an NES. Or the excitement about the Game Genie and the Contra cheat code. Some of this audience may be too young to remember DuckTakes…at least the incoming freshman. A lot of articles in recent years have mentioned this strange trait of my generation, The Millenials (or Gen Y): We just don’t grow up as fast, but why should we? I look back on my parents. They married at 22, bought a house, got their careers and the kids by their early 30’s. And now, they are divorced. Many of my young friends today have divorced for the same bottom-line reason: they thought they had figured out “what they want to be when they grow up”…but then they changed. 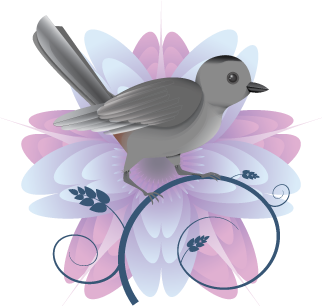 The 20’s is a time of spiritual and value shifts, and nebulousness about the future. We got mixed messages from our parents: “you are special and can do whatever you want. College is for fun! Worry about the career later” …but then look perplexed when you want to go to art school. They tell us “life it short, you are young”…but then turn around and ask why at 25 we are not married and have no prospects. Just 3 years ago, teaching was the safest job…now many friends who have pursued that career have been laid off, or are competing with applicants in the hundreds. Who would have thought? September 11 happened on my first day of classes at college. How ironic. Our country has never been the same since then, and I honestly think we have never recovered. A large portion of my friends live at home. Not because they are lazy, but because who can afford to live on their own in this economy? I do live on my own, but I am not going to lie. Money can be very very tight, especially since salaries have not kept up with inflation in the past 10 years, and the college degree is now yesterday’s HS diploma. When I got my first one-bedroom apartment in 2006, I paid $650/month base rent. That same apartment costs around $750 or $800/month today. This was in Atlanta. If I were 17 today and trying to get into my undergrad institution with the credentials I had in HS, I would have been flat-out rejected. At 27, I can finally say I my career is finally starting. Thank God. I may never own a house. I may never retire. I may never get married. However, I can say with more certainty that I will never see a dime of social security than I can say that the sky is blue…despite that large sums of money were taken out of my entry-level paycheck to support the voluminous amount of Baby Boomers. Single professionals whose entry level salaries keep them too rich for food stamps, but too poor to own property, are taxed though the nose. The youngest Millenials are now of voting age. If we are as large as they say we are, then where is our political power? We don’t bother voting when the candidates don’t give a damn about us. In the past election, all both candidates appealed to the “nuclear family” when referring to the “middle class.” Many of us are not able to get married and start families right now just so we can earn the nest egg to even start a family. Many of us will never make it, more than ever before. So let’s pray that we continue to recover so that our dreams hope for the future are not crushed, and we can become the middle class that drives this country. And that our parents can enjoy the retirement they for which they worked so hard because, let’s face it, these times have hit them just as hard. For my generation, who has been launched into a constantly morphing, global economy, our definition of the American dream has been modified. Forget the beach house and the fancy vacations when we retire. It is not about the money, but about quality of life and career satisfaction. Money is only important as a way to meet basic needs. And if that means a bit of college humor as we approach our 30’s, then so be it! There has been a lot of buzz in library blogdom and listservs about getting that first job in this field. As librarians are always so committed to helping people, many have posted excellent tips and tricks for procuring the interview, acing interviews, and getting experience/networking to break into the field. And as a diligent and creative job seeker, I take appreciative heed to that advice. Yet despite attending conferences, completing internships/committee work, being flexible and geographically mobile, and seeking professional guidance from my mentors, there are a lot of factors that are out of my control. What happens when “you do everything right” and yet things still seem so wrong? Last Sunday, I had to swallow my pride and had my pastor pray over me during this time, and to ask God to intervene on my behalf. I have seen the impressive CVs of new librarians, many of whom have already published 5-10 articles before even receiving their MLIS. Many of whom have completed the MLIS as a 2nd masters and have tons of teaching experience already under their belts. After sending out my 25th or so application, and getting yet another rejection letter in the mail, I realized that my faith in God was all I had. Only He would be able to open a door for me, to put the right person in my path, so that I can move on in this stage in my career. I am fully aware that I am a high-risk hire. I don’t have the pages of documented experience that many others have, yet I have a plethora of job skills that can easily transfer into a library/information setting. Someone is going to have to take a chance on me, and I don’t blame employers for being risk averse, especially in these hard times. My CV may not stretch to the moon, but I guarantee that if hired in the right place, I will go beyond the solar system in what I will bring to the table. Case in point: my current employer took a chance on me, hiring someone right out of college with only summer jobs to my name. What they got in return was a loyal employee, someone who was not afraid to take on new projects, someone who was ready and willing to pull up her sleeves and get the job done (and get it done on time). And I am still employed! Yet with so many applications, employers are so bogged down and can only see the resume data front of them, rather than extrapolate a picture of the candidate that extends to more than a bullet-point list and a couple paragraphs of a cover letter. Most jobs for which I have applied receive 60, 70, or 100+ applicants per opening! It is this reason that I need to learn to rely on God to work on my behalf, which is a very humbling experience for someone who prides herself on independence and hard work. Undoubtedly, every person who has undergone a long stretch of being single has heard the advice “You will meet the right person where you least expect it.” I strongly believe that the same advice applies to job hunting. Yet one’s first instinct is to balk at that advice. “Am I supposed to sit around and wait for it rather than actively seek it?! How can I possibly not think about it when it is consuming every waking hour of my being, as I am in the world right now watching my friends and colleagues get married/get jobs/have children?! The answer is in the scripture above! But what does that mean? After reflecting on that passage in Matthew, it means to make God’s word a priority in your life. Does that mean read your Bible more, tithe more, pray more? Not always, though if in doing those things you achieve what the passage is saying…seek God’s approval and a relationship with Him first, and not man’s. The career and the marriage, in this country, are sought after as status symbols. Yet jobs can end at any moment, and so many marriages end in divorce. All that is stable and true in this world is God. After receiving constant rejection in my search, and wondering if I am inherently flawed, I have to step back and realize that it is not how God sees me, and not judging myself based on some status symbol. God does not tear people up, hurt them, tell them they are worthless because they lack a job title, money, or a spouse. The devil does plenty of that. But ironically, in truly seeking the kingdom and a spiritual connection to God, guess what? Those “worldly things” like the job and the spouse end up popping up. A couple weeks ago, the movie Charlie and the Chocolate Factory was on TV (the 1970s movie, not the creepy one with Johnny Depp). It is one of my favorites stories. In my current context, I was able to glean some interesting revelations in seeing this movie again. (As a side, this story has a lot more depth to it than people realize). I distinctly remember the scene where Charlie goes to visit his mother as she is doing laundry well after dark. This was after the 4th golden ticket is found. Charlie is very upset at this point, knowing how the odds are stacked against him. After all, millions of people all over the world are looking for these golden tickets, and most of them have the funds to buy a lot more chocolate bars (hmm, how reminiscent of a certain job search…). He tells his mother to essentially stop hoping for him to get the last Golden Ticket, and he asks her how much longer will they have to keep living in poverty. His mother tells him the day will come “when you least expect it.” At this point of the movie, Charlie’s hope and faith are being tested. 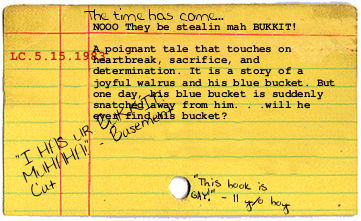 As the story goes, the 5th ticket is found, much to Charlie’s dismay. Disappointed, he looks to the ground, but then something happens! He finds some money sitting in a sewer grate. This is enough money for him to buy some food for his family, and to splurge a bit on his favorite item: chocolate. He walks into the candy store and non-chalantly asks the “candy man” for a Wonka Scrumdiddly-Umptious bar. As soon as he pays for the bar, he wolfs down the chocolate, as many of us tend to do when we are depressed and just need some physical comforts. Charlie then decides to buys a second chocolate bar for Grandpa Joe, who has has inspired him to keep dreaming and to never lose hope. Charlie then exits the store, and there is a crowd of people around the newspaper stand. Apparently, the 5th golden ticket claim was a fraud, and there was still 1 ticket out there just waiting to be found. With a small smirk and a glimmer of hope starting to come back, Charlie opens the 2nd Wonka Bar and sure enough finds the last golden ticket! I describe this scene in detail because there are 2 important lessons received from this. One, you never know where and how the opportunity will come from. In looking at stories of people who have achieve great success throughout history, it often happened because of a life-changing event…because God led them through the fires to make them perfect and whole as people. And just as things could not get any worse, God comes through, just like He did for Charlie. But this is not just a story about miracles. A fact I overlooked the first many times I watched this movie was the fact that the chocolate bar he bought for Grandpa Joe was the one that contained the golden ticket. What if Charlie decided not to buy the bar, and pocketed the rest of the money for himself? He would have missed out on the opportunity of a lifetime! Hence the passage above about not growing wearing in well-doing. Despite all the poverty and loss of hope he was feeling that day, Charlie still kept others in mind. And as we all know the story, it was Charlie’s selflessness and integrity that enabled him to ace the ultimate job interview…to be Willy Wonka’s successor. This blog post is part of an assignment I am doing for my Reference Course for the Sciences disciplines. The purpose of the assignment is for us to pick a science-oriented library that has recently undergone a renovation to meet the needs of the users. 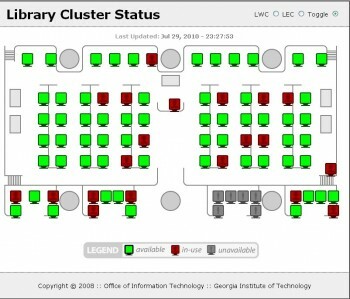 So, I decided to discuss the recent learning commons renovations at the Georgia Institute of Technology, where I just completed my Spring practicum. In this post, I will introduce the learning commons at Georgia Tech and describe some of the highlights. While I was interning, I met with Charlie Bennett, who is the Commons Coordinator at the library. Charlie is responsible for monitoring the commons, ensuring that it is functionally designed for user tasks (i.e. independent studying, group collaborations, etc.). He also gave me a tour of the Georgia Tech library commons area. The Commons actually consists of 3 areas: the east and west commons on the first floor (LEC and LWC respectively), and the newly renovated 2 West area on the second floor. The LWC contains a wide space of desktop computers provided by the library. Whenever I was at the library, this area was always packed, and it was very difficult to get a computer. There is a screen upon entering the library that shows which computers are in use (in red). Users can also go to the library website and see available terminals. Now, of course, since it is the summer and it is almost 11:30 PM (up late as usual! ), many computers are green (but this is not the norm!). The East Commons is a very interesting area of the library, and has a lot of innovative aspects. The area has a more modern and “hip” feel. It contains a cafe and vending machines (including ones that sell coffee), so users can get that extra bit of fuel to get through the school’s intense curriculum. This space is also used for the campus film society to host events, as well as other campus-related exhibits. This area is very focused on collaborative group work. It also contains computer stations with large monitors so multiple students can share a workspace, as well as a small DVD library. A key theme that Charlie wanted to focus on in this area is flexibility – to give the user control of how he/she utilizes the space. Thus, furniture is lightweight and easily movable. One feature that the commons has serendipitously acquired was movable extension plugs that hang from the ceiling. These were actually left by the electricians during the renovation, but Charlie decided to keep them so that laptop users were not restricted to areas where there was an outlet. I cannot tell you how many times I have been frustrated going into a Starbucks , bookstore, or other WiFi hotspot and not be able to use my laptop because all the seats near an outlet were taken. During long study hours, a laptop battery usually will not last. Students even have flexibility over the lighting. Charlie implemented RBG overhead lighting (similar to what is used in stage lighting), instead of fluorescent lighting. Students can customize the amounts of red, green, and blue in the lighting to something that is easier on their eyes. This area is located on the second floor. It is a very open workspace for collaborative projects. It contains large, restaurant-size booths and tables for study groups to meet, or for individual studiers to spread out (especially for the architecture students). Collaborative work areas are partitioned by translucent screens to give the study groups a sense of solidarity without making the area seem too claustrophobic. I have also seen students here utilize whiteboards to work on complex math problems or tutor others. In the next post, I will discuss my thoughts about the renovation and how these improvements have affected users. My ALA blog contribution for the LITA blog is now posted! This post covers the aforementioned session at the conference this June. Read all about how 2 institutions are handling their digital projects here! In other news, I passed my Capstone exam! Yay :D.
Make your own library card! 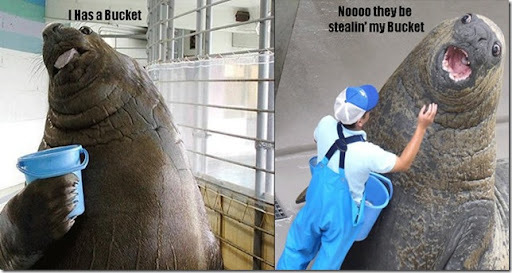 I has a bukkit....NOOO they be stealin mah bukkit!!!! Every Friday afternoon, from 12 – 1 PM, Georgia Tech’s radio station (WRECK 91.1 FM) hosts a show called “Lost in the Stacks“, which features music and interviews with various librarians, faculty, and staff. I have taken an interest in the show because they have been interviewing various individuals I have had the pleasure of meeting during my studies and internships. Usually, the show revolves around a particular theme (one 2 Fridays ago was “Bicycles”, for example). Tonight, I am listening to the archive of the show they did today; this week, they have invited some librarians from Georgia State University to discuss what they do at the library, as well as what is going on at the GSU library. Ironically, I have been a fan of GSU’s radio station (88.5 FM) since I was in middle school…they used to play strange and eccentric music late at night. And for those who know me, I am a fan of staying up late, as well as strange and eccentric things :). I would always tune into the station, and pretend that aliens were communicating with me through the music. 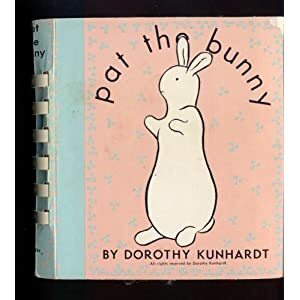 Anyway, weirdness aside… as I was listening to the show, I was realizing that this show could serve as a great resource for current or future MLIS students such as myself to learn about the various roles people serve in the library. I personally think that it’s a cool idea that the library has a radio show. Of course, this is one of the many examples that the Tech library has been forward-thinking regarding library services and marketing. But having a presence on the radio station (even if not a lot of people listen to it) emphasizes the fact that there is more to libraries that just a building that houses books and journals. If anything has been beaten into my head since my intro to reference class I took my first semester of library school, it is that libraries are all about dissemination of information. Freedom of information is the rock on which ALA builds its house. However, it seems unheard of for libraries to utilize the airwaves as a means of dissemination. A library that collaborates with student activities – intermingling with its primary user population – can serve as an effective means of outreach. At little cost, an academic library could reserve a spot on the campus radio, which not only broadcasts within the university boundaries, but into the public as well. Furthermore, today’s show in particular reveals that there are many facets to librarianship. Librarians are not just frumpy old ladies who sit behind a desk and scowl, but provide a diverse set of services, and come from a variety of different backgrounds. One guest has a developed a very technical background and has taught many sessions on emerging technologies, while another guest had a marketing and graphic design background (as well as creates his own comic books). I can think of a couple interesting ideas that libraries can utilize the radio. Similar to Lost in the Stacks, subject specialist librarians can host a show related to an interesting theme on their topic specialty…something educational, yet fun and interspersed with relevant music. Or, I can see the library present itself on the radio as an information sleuth…offering a answers to life’s commons questions. Maybe something similar to Loveline with Dr. Drew….but perhaps less sexually charged. After all, librarians are sexualized enough due to the fantasies some men have about us wearing a leopard print thong under our maxi skirts. Perhaps the library can use the airwaves to host fascinating intellectual debates. I have a fond memory of back in my undergrad days where a faculty member hosted a debate between this ultra feminist religion professor, and the head of the religion department at crazy fundamentalist Bob Jones University (BTW, they really need to change their domain name from “bju.edu”…just reeks of pent-up sexual frustration). The debate topic? Homosexuality. I was actually so excited about that one that I wanted to sit up in the front row and bring a tarp. And I know many friends who were eager as well for the verbal jousting that would ensue. The turnout, of course, was tremendous. The library, which prides itself on objectivity, could serve as a great debate host. As someone who hopes to enter to profession some way, I want to keep the traditions of the library, but I also want to view it in a new light. The library is not what it was 30 years ago (anyone can tell you that), and if the profession is to survive, it is imperative to be creative to find new ways the library can connect with and serve its users. I think as more and more people from diverse backgrounds are entering the profession, it may open up a new spin on library services that appeal to today’s user…which would hopefully help those with the purse strings to not view the library on the top of their list of programs to be slashed. Others solutions included placing the bar code on the inside of the book, while another mentioned rebinding it. Perhaps the book could find its home in reference (it looks like sports ready reference to me), among books that do not need to be circulated. There, the book could be bar-coded from the inside, or not at all (depending on the collections). The archivist in me wants to keep the book in its original condition…it all its gaudy glory. Because God made everything in the world different, and without such oddities, the world would be a boring place, so…why not have a book in circulation that is different too? If that book was stripped of all its turf, it runs the risk of being ignored…just the same as all the other books. 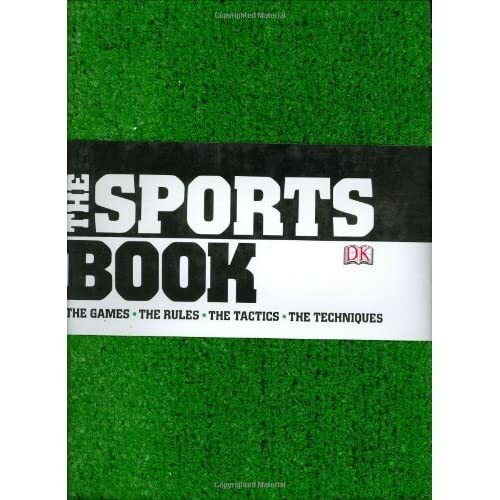 The average sports enthusiast, who is visually stimulated and only aware of the obvious, could easily look over this book if its bristly bright green grass was no more.